« PRSPCT Presents Thrashbash aka Thrasher’s Naughty 40! Ticket: €10,- | Presale: €8,- | Now on sale! In April 2004 we held our first ever event. 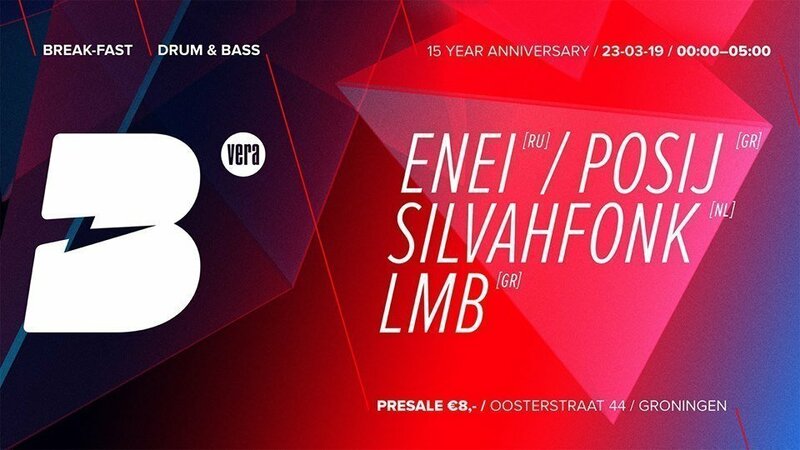 Now 15 years later we are still going strong, so it’s time to celebrate with this great line-up! Hailing all the way from Saint Petersburg, Enei is known for his minimal and techy sound. Being exclusively signed to one of the most critically acclaimed labels in the Drum and Bass scene, Critical Music, Enei secured himself a spot at the top of the scene. With some fresh released tracks on the Questions EP with KLAX, a collaboration on Hyroglifics latest EP and his last solo EP which came out last November, you can expect a set filled with a selection of some of the best minimal bangers and rolling tunes. Constantly exploring the limits of his own creativity, Posij pushes the boundaries for experimental bass music. Being no stranger to Break-Fast, both behind the decks and from the crowd, it’s a pleasure to have him with us to celebrate the 15 years of Break-Fast. Full of energy himself, Silvahfonk is ready to bring the same energy to the dancefloor as well. Having done this successfully in the past on the Break-Fast stage, it is not a surprise to see him at our 15 year celebration. Expect a set full with the best of drum and bass and jungle! When celebrating the past 15 years, it’s good to think about the future as well. That’s why newcomer on the block, LMB, is joining the Break-Fast crew. With his amazing debut EP on the label Overview, there is no doubt LMB will put his stamp on the scene sooner or later.